That’s how Elizabeth feels about her experience training at ForeverStrong. It’s a quote from Beyonce’s hit song, Freedom. As her idol, the artist Beyonce continues to inspire and motivate Elizabeth through her fitness journey. So does ForeverStrong. Maintaining consistency with a fitness routine and healthy lifestyle is the only way to truly see results. This is also many people’s greatest battle. For Elizabeth, it took three factors to finally help her get serious about making a permanent lifestyle. One of the challenges that Elizabeth fought when trying to get lose weight and tone up was consistency. Many people can relate to this. A break or a missed day turns into a missed week or month. Finding an exercise routine that you like can be difficult. At traditional gyms, it’s often difficult to see the results you want if not properly educated on how to operate the machines or what to do to in order to achieve your fitness goal. Our ForeverStrong fitness system helped Elizabeth to overcome the challenge of inconsistency with our laser focused attention we use to keep our clients on track. With the ForeverStrong program, we also schedule routine check-ins and monthly measurements to ensure that Elizabeth got all the accountability she needed to stick to her program and remain consistent with her workouts. Since starting her ForeverStrong journey a year ago, Elizabeth has had an incredible weight loss of 71 pounds and still counting. She has finally found a workout routine she enjoys and has stuck with it. Her favorite part is “sweating it out with the 10:15 class” and seeing how much she has improved since the start of her program. 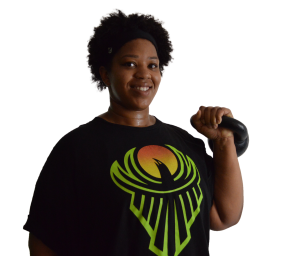 Not only has Elizabeth finally found a workout routine that she enjoys and is consistent with, she has also experienced physical changes as well. “I definitely don’t think my results would have been the same if I would have tried to put a plan together on my own. 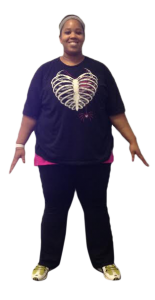 Joining ForeverStrong was the right decision.” She has seen positive changes in her weight, strength, posture, and attitude towards exercise. She has also found herself dreading her workouts less because she knows that they will not be as difficult compared to her first class. Listen to Elizabeth’s advice and join ForeverStrong sooner! Congratulations, Elizabeth! You are ForeverStrong! We know how challenging it can be to stick to your workout and be consistent. We admire your strength and determination to live a healthy lifestyle! If you’re like Elizabeth, and struggle with sticking to your workout routine and to reaching your fitness goals, then let us help you by calling 301-452- 5547 to schedule your complimentary fitness consultation.